Charly is former Eintracht legend with 602 appearances in bundesliga which makes him an absolute record holder probably for whole eternity. He didn't play too much in NT because Beckenbauer didn't like his offensive play which limited of course Franz himself making offensive moves, therefore he insisted in Georg Schwarzenbeck to be in the lineup alongside him. Charly was very offensive defender, strong with good pace and jumping abilities, strength in man on man situations, good tackling, very combative with good tactical awareness. 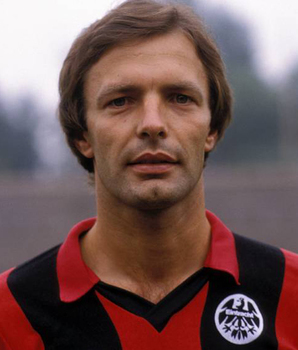 Körbel made his debut in the Bundesliga as a 17-year-old on 12 October 1972. He was up against a player that went by the name of Gerd Müller. The young defender had a great game against the league’s best goalscorer in a match that Frankfurt won 2-1. He first appeared for the German national team in December 1974 in the 1-0 win against Malta. But then in October 1975, and still not 21, he won his sixth and final cap in the 1-1 draw against Greece. In his personal roll of honour, he won four German cup winners medals in 1974/75/81/88, one UEFA Cup winners medal – 1980 – and an amateur European Championship in 1974. Frankfurt won the German cup competition in 1974 and 1975 and Körbel played a big part. In the second final against MSV Duisburg, the defender scored the “golden goal” in the 1-0 victory. “That was very satisfying,” said Charly, who scored a total of 43 Bundesliga goals. Some were very important. For instance during a difficult period for Eintracht, Körbel headed the equaliser in the 1-1 draw against Hanover in a decisive relegation battle. In the relegation play-offs against 1. FC Saarbrücken, Körbel was instrumental in keeping Frankfurt in the Bundesliga. Eintracht’s captain for the previous eight years had played outstandingly. For the fans he was an idol. He also remained loyal to his club after his playing days were over. However, his career came to an end a little disappointingly. In 1991, Charly was shown the yellow card in the penultimate game of the season at FC St. Pauli. “All the players, including the Pauli players, ran up to the referee and remonstrated: You can’t do that. It’s his fifth booking,” remembers Körbel. The yellow card stood. A big farewell celebration was held in his honour on the final day of the season. But suspension prevented him from adding to his 602 appearances. Afterwards Körbel became youth and assistant coach at Eintracht. He and Head Coach Dragoslav Stepanovic would have led the team to the championship in 1992 but for the defeat in Rostock on the final day of the season. He twice – in 1994 and 1995 – took over as Eintracht’s head coach and passed the coaches exam with flying colours. But then in April 1996, he parted company from the club with whom he had been associated with for 24 years. In October 1996, Körbel took over as coach for a year at VfB Lübeck, and then for six months at FSV Zwickau.“Loyal” Charly returned to Eintracht in 2001, at first as chief scout responsible for spotting new players. He then stepped up to become a member of the board. Being in charge of Eintracht’s FootballAcademy gives him the most pleasure. Körbel sees it a being the foundation upon which Eintracht can soon be as successful as they were in his playing days.